In the last few years, beet salad has become a popular item on restaurant menus (Beet and Goat Cheese Salad, anyone?). And why not? It is an economical dish that provides a wonderful combination of flavors and taste, and a vivid contrast of colors. Beets are nutritious vegetables available through the whole year. Beets pair beautifully with salad greens, cheeses, and light dressings. But, most of all, beet salads are easy to make and they taste really good. The popular beets and goat cheese recipe is only one of the numerous tasty combinations you can rely on to create a delicious beet salad at home. 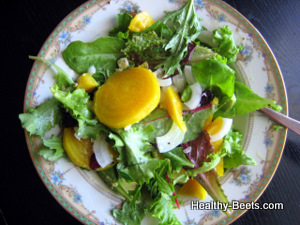 It is really easy to mix beets with salad greens in a 4-ingredient salad. Arrange your favorite salad greens on a big salad platter or individual plates, put a few slices of roasted beet on top, drizzle with your favorite dressing, and sprinkle your favorite cheese or nuts on top. Add a sliced pear, or apple, or even blood oranges or tangerines. It is all good! For a more substantial meal, combine beets with other root vegetables and add mayonnaise or Greek yogurt. Make your salad sweeter by adding prunes and walnuts, or give it an extra bite with fresh onions and gourmet vinegars. Cooking beets for salads can be done in several ways. You can select any method that suits your taste or schedule. Roasted beets will bring intense sweetness and rich color to the salad of winter greens. Boiled or steamed beets are easy to cook and peel, and they will taste of their own earthy beet self. No time for boiling or roasting? Cook beets in microwave – they will be ready to use in no longer than 15 minutes. Pickled beets on top of greens make a delicious colorful and piquant salad. Finely grated fresh raw beets, along with other root vegetables in their season, added to salads, will increase their nutritional value. Raw food enthusiasts would welcome salads made with raw beets to add variety to everyday diet. These salads include salad greens as garnishes, and should be prepared shortly before serving. Otherwise, the greens will become flabby, and the dressing watery. Light salads could be served as a starter or a salad course when you have meat or fish as the main course. Quick and satisfying light meal. One of my favorites. A vivid display of colors and flavors. For a splash of golden color and mild taste. Healthy and colorful all-season dish. Crisp and cool salad for all seasons. Juicy fresh onions and red beets with arugula. Winter to spring beet salads made from left-over or freshly cooked ingredients in tasty combination with a home-made French dressing. Simple and deliciously crunchy appetizer. Beet and potato salads have higher amounts of sugar and starch. These salads should not be served with heavy meals. Instead, you can serve one of these salads as a light lunch or late dinner, and even prepare them in advance. Beet and potato salads will hold a day or two in the refrigerator. A favorite winter salad of Russian cuisine. Serve a beet and potato salad as a light vegetarian lunch or supper, or balance a heavy meal on your dinner table. Serve as an appetizer or a tasty side dish. Quick and easy piquant starter. Make one of these sweet and tangy beet relishes next time you are having meets or cheese for lunch or dinner. If you like making different types of salads, visit Peach-depot.com for peach salads made with greens, jello, meats or mixed fruit.